Spring has finally sprung in Northwest Arkansas. The sunny days are coming more frequently and the temperatures are slowly creeping toward tolerable. On those sporadic 60 degree days that tease you happily into the outdoors, there is no shortage of things for you and your best furry friend to do together. 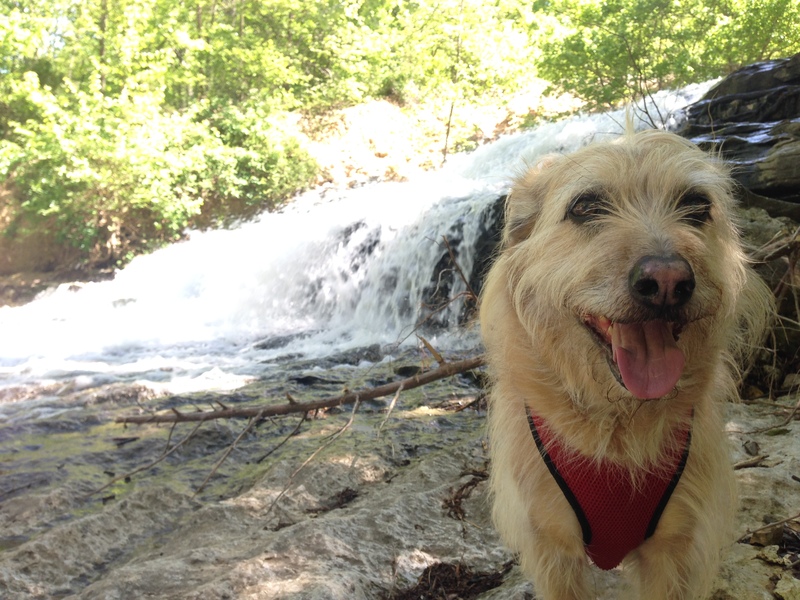 Whether your kind of “outdoorsy” means drinking on a patio, cavorting in a park, or hiking a trail, I’ve got you and your dog covered with this list of easy to find favorites in our little corner of the world. 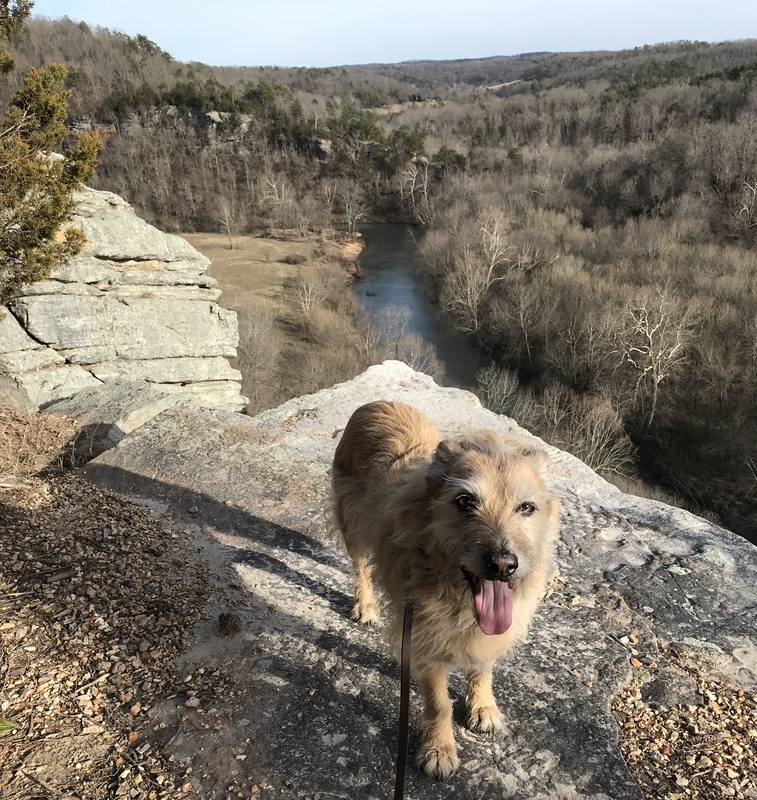 While I’ve only mentioned 6 in this post, Northwest Arkansas is chock-full of bars and restaurants that welcome dogs. Many of our establishments provide water bowls and treats, and a few even host dog-centric events to support our local humane organizations. Whether brunching or just hanging out in the sun with a cold beverage, you’re sure to find exactly what you need in this very dog-friendly area. For a complete list of dog-friendly drinking and dining, check out NWA Dog Blog, Dog Friendly Fayetteville or Dog Friendly Bentonville. You can also just follow us on Instagram, cause even when we aren’t on the road, we are out and about! Boasting one of the best dog-friendly patios in NWA, you just can’t beat the big deck at Sassy’s Red House. There are two Sassy’s locations, but the one on College Avenue is our first choice. On a sunny day, this place is likely to be crowded, but the spacious area never feels too congested. You should anticipate seeing several other dogs enjoying time with their people, so if your pup is easily over-stimulated, he might do better elsewhere. I’ve never been here when the waitress didn’t offer to bring Henri a water bowl, and sometimes I get him his own order of brisket. He also digs the fried pickles, but maybe it’s just the ranch. With the exception of only serving beer and wine, this is what I always imagined my dog bar would be like. Located in a refurbished gas station, with outdoor seating in the front and back, City Pump has quickly become a new favorite. Drinks are served from the inside bar and stainless steel water bowls are available for your dog. Asian, American, and Puerto Rican nosh can be purchased separately from any one of several food trucks located around the perimeter of the front patio. During warmer weather, the stage in the back hosts local artists, and soon, I’ll be using that grassy yard for Doga classes. I hope you’ll join us! Wine lovers, this is for you! Located just off the square in downtown Bentonville is Ramo d’Olivo or simply “Ramo.” Wine shop and wine bar, they also carry organically grown olive oils, and a variety of flavored balsamics and vinegars. Out back you’ll find the dog-friendly garden area that’s shared with Oven and Tap pizza. Feel free to order something from the pizza menu to enjoy outside, while ordering your wine from Ramo. Offering over 200 varieties of wine by the bottle, and always something interesting by the glass, you’ll have no trouble finding just the right vintage for your doggie date night. Bike Rack Brewing has two locations in Bentonville and one newly opened spot in downtown Springdale, but the 8th Street Market space in Bentonville is my pick for dog-friendly fun. Since they don’t serve food, dogs are allowed both indoors and out at Bike Rack. This makes it one of the few winter options for you and your four-footed pal, but you’ll want to go during the summer, too. The large outdoor area in Bentonville features a stage, food trucks, and picnic tables for eating and lounging, and it’s pretty hopping on summer afternoons and evenings. If that’s when you go, make sure your dog is well behaved and socialized. Need a dog trainer to go with you to help manage your pooch’s manners? Call me. Located in downtown Eureka Springs is a restaurant so dog friendly they have a special doggie gate entrance by the front door. Local Flavor has two patio areas, both dog friendly, and the larger patio is accessed from the side opposite the front door. You’ll need to poke your head inside to let them know you are there to be seated. They have an amazing white sangria that is the perfect afternoon sipper when you’re tired of shopping, and the patio overlooking S. Main Street is great for people watching in this quirky little art town. The patio isn’t very big, so if it’s a pretty day expect to wait for your seat. A newcomer on our radar, we discovered this Creekside Taproom when I drove past it on the way home from the dog park. It looked like it ought to be a dog-friendly place, so I went back to check it out. I’m glad I did. This family-friendly taproom serves Arkansas craft beer and wine. 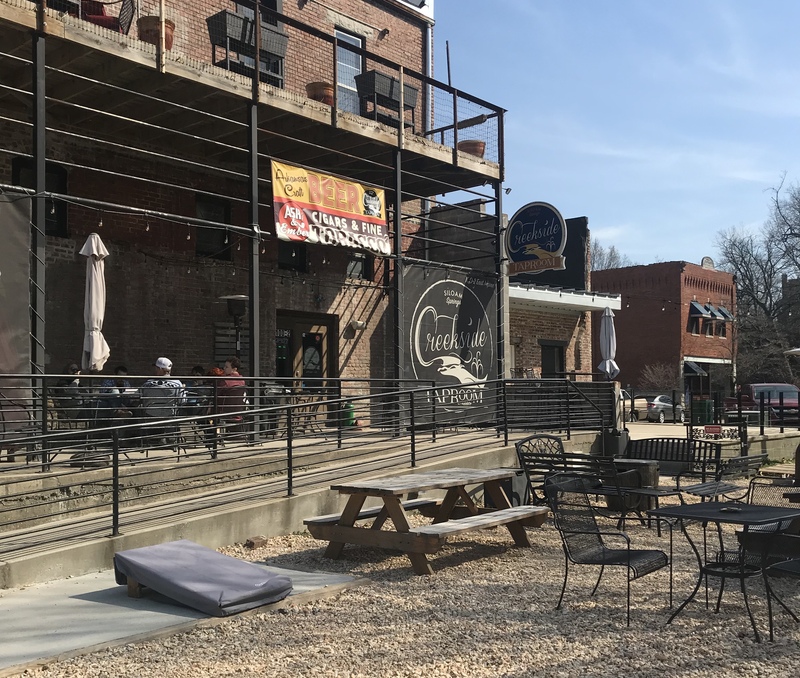 It’s the perfect spot for out of towners to put their hands on the best of Arkansas’ beverage scene and it’s a great place to lounge with your pooch after burning off some energy at the dog park. Enjoy music in the beer garden on the 2nd and 4th Friday nights, or get your pack together for trivia on Tuesdays. Northwest Arkansas is lucky to have NINE dog parks scattered throughout the region. There are ten if you count Lake Wilson (mentioned in the trails section), and an eleventh coming soon to Johnson. 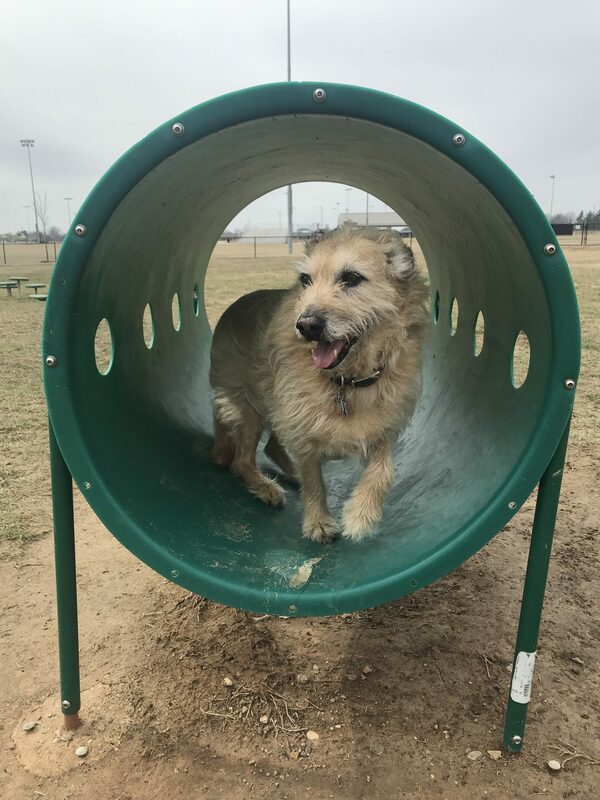 While I’m not really a dog park person, and thankfully, Henri has never been much of a dog park dog, I know a lot of you like and need them in your dogs’ lives. Hopefully, you’re using them responsibly, following the rules, and PICKING UP YOUR POOP. For real, y’all. Pick up your poop! Located at Bryce Davis Park, the Iams Dog Park is a 3-acre park comprised of two fenced yards in the middle of an open space. Public parking is located at 1595 N. Dartmouth Ave. From there you’ll follow the multi-use paved trail to the dog park. Observations: Separate yards for bigs and littles, paved entry/pavilion area with picnic seating, human/dog water fountain, no shade, no children under 8 years of age, public restrooms nearby. Part of the newly developed C.L. Charlie and Willie George Park located on Hylton Road in Springdale, I was pleased to discover agility equipment in this dog park, but super-disappointed to find poop on one of the obstacles. Like, actually ON it. YUCK! I also noticed waste in the dog yard, and though there should be none, it wasn’t a gross amount. Overall this park is nice and fairly clean. There is bench seating throughout the yard and trees toward the back fence line should provide some shade in the summer. Observations: Convenient parking directly in front of the park, two separate yards for bigs and littles, bench seating throughout the play yard, paved pavilion area with picnic seating, human/dog water fountain, agility equipment. Murphy Dog Park is a private park supported by memberships ($5/year) and one of the best in the area. While guests are always welcome, membership helps with upkeep and ensures that at least member dogs are well-behaved and vaccinated. Three fenced areas provide space for bigs, littles, and an extra yard for training or special needs. During peak times, the park is volunteer supervised, which means you don’t have to worry about pointing out to someone that their dog is a jerk; the volunteer will handle it. Observations: Convenient parking, guests welcome, no children under 10, volunteer supervised at peak times, separate yards for bigs and littles, third yard for training/special needs, bench and chair seating, dog wash station, kiddie pools in the summer, lots of shade. Finding this one was an adventure! Not because it’s hard to locate but because I’m bad with directions and easily distracted. Nobody told me there was a road and I could’ve driven right to the parking lot. Instead, I drove to Lake Atalanta, parked at the Clark Pavilion, took the wrong trail, lost cell service in the middle of an Instagram live video, tried again but my phone battery died, went back to the truck to charge the phone, drove to the other side of the street to see if the park was over there, found an access road—totally trespassing!—ran into a friend walking her dogs and finally got pointed back in the right direction. From the pavilion (looking at the pavilion) take the trail to the left, NOT the one located directly behind it. You could put 1615 Pleasant Ridge Road into your GPS and pull right into the parking lot, but then you’d miss all the natural scenery. This dog park is one large yard, and the day we went it was a large dog dog party. While public restrooms are available, I was told by one of the park-goers to be sure to always lock my vehicle due to recent break-ins. Observations: Convenient parking, one area with no designation for bigs and littles, no seating, no water, some shade, public restrooms available. Located just off the historic downtown area in the Railyard Bike Park, this Rogers park has two small, nonadjacent play yards, which makes it perfect for fence fighters. Active pups will enjoy the agility equipment and humans will appreciate the public restrooms. A parking lot is in close proximity, but expect it to fill up quickly on pretty days or any day there is a bike competition. Observations: Close parking, two nonadjacent fenced areas, no water, no seating, some shade, public restrooms available. Right off the highway on North Walton Blvd., many think this park is in Bella Vista. It’s not. It’s on the border in Double North Bentonville. Three separate play yards offer plenty of options for all size dogs, but the proximity to a busy highway could be a problem for dogs intimidated by traffic noise. Parking is located on either side of the dog park with public restrooms nearby. If the yard becomes too rough or crowded, the walking trail offers a nice alternative for burning off excess energy. The Bark Park is open sunrise to sunset and closed on Wednesday mornings from 7:00 – 10:00 a.m. for maintenance. The website says there is agility equipment, and there used to be, but it’s not there anymore. Observations: Convenient parking, three separate play yards, a few bench seats, no shade, near busy highway, dog water fountain located at public restrooms. Located on the north end of Bella Vista, on backside of the Scottsdale Golf Course near the ball fields, the K-9 Corral is another well-maintained private park. If you use the Google Maps address it will take you to someone’s house, but the park is behind that cul-de-sac. Just get in the vicinity and look for the ball fields. The park is closed each Wednesday from 1:00-3:00 p.m., April through October for mowing. Every second Wednesday the park closes at 1:00 for flea and tick treatment donated by West Termite & Pest Management and re-opens on Thursday morning. Observations: Private park for members and guests, well-maintained by Bella Vista POA, two yards, seating, shade, water source, no smoking, public restrooms nearby. Located at Bob Henry Park, Tails & Trails is the newest addition to the Northwest Arkansas dog park scene. Sponsored by Simmons Foods, this tidy little park spans a little more than two acres and boasts three separate play yards labeled for small, large, and agility course. There isn’t any equipment in the agility yard yet, but it’s only been open since September 2018. Hopefully, it’s coming soon. The park is open from sunrise to sunset and closed Wednesday from 7:00 a.m.- 10:00 a.m. for maintenance. City leaders plan to host events for pets and people year ‘round. There’s no seating, and though there might be shade in the late afternoon, this park is mostly in the sun. Observations: Convenient parking, three yards, regularly maintained, no seating, no water, public restrooms. We didn’t know we were saving the best for last, but apparently we did! 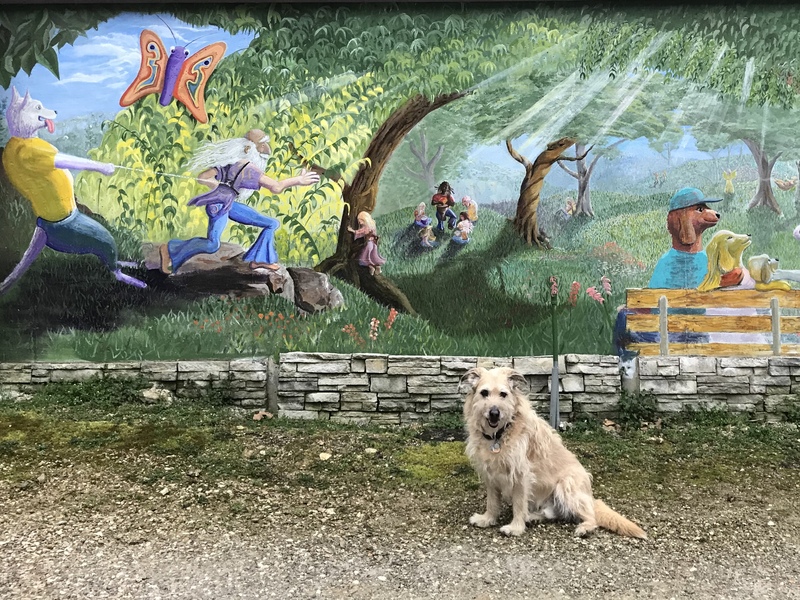 Just minutes from downtown and several dog-friendly patios like the one mentioned above, we arrived at the Eureka Springs Bark Park just in time for the rain to start. Looking more like an Ozark woodland area than a dog park, you hardly notice the black fencing surrounding the park and separating dogs under 30 pounds from dogs over 30 pounds. With public restrooms, bench seating, and plenty of shade, this hillside gem might be my favorite of the nine dog parks located in Northwest Arkansas. There is even a brightly colored mural painted on the wall near the bathrooms. SO very Eureka! Observations: Convenient parking, separate yards for bigs and littles, bench seating, LOTS of shade, hillside terrain, water fountain, public restrooms, no children under 8. Because Northwest Arkansas is square in the middle of the Ozark Mountains we have an abundance of beautiful outdoor hiking trails that range in difficulty from super-easy to OMG-why-did-I-come-out-here-alone-with-no-cell-service. The five trails I’m listing here, however, are no more than 30 minutes from their respective town, and are easy, novice hikes perfect for leisure strolling. You, your old dog, your kids, and probably your parents can do most, if not all, of these trails. The only trail in NWA officially designated as an off-leash, dog-friendly trail, is at Lake Wilson. It’s pretty muddy in the spring and you should watch out for copperheads near the water’s edge, but it’s less than 20 minutes from downtown Fayetteville and more like nature stroll than a hike. There is a boat ramp that’s a perfect spot for fetch with your water dog, and I hosted my paddle clinic here last summer. It’s a regular jaunt for Henri and me, with a lap around the lake taking no more than an hour. Just remember the area is leash optional. Don’t rely on others to control their dogs as well as you do, and be cautious of taking dogs with reactivity toward other dogs. Lucky for you that I got lost looking for the dog park at Lake Atalanta or this wouldn’t have made my list. Paved trails meander around the lake and through natural areas that connect to the Railyard and the Lake Atalanta Dog Park. The landscape includes crystal clear creeks, woods teeming with rustling ground critters, noisy birds, and rock formations. Man-made bluebird houses dot the path and placards denote key natural elements, including the story of an errant pet sheep. You’d never know you were only minutes from downtown. Located in downtown Bentonville, Crystal Bridges is situated on 120 acres and boasts more than 3.5 miles of trails that include natural and landscaped environments, easily accessed creeks that are perfect for a quick dip of the paw, outdoor sculptures, and artist James Turrell’s Skyspace structure, The Way of Color. Family events like Artosphere and the Forest Concert Series are fun for everyone and welcome well-behaved, art-lovin’ canines. Tanyard Creek Nature Trail  in Bella Vista is less than a 20-minute drive from downtown Bentonville. 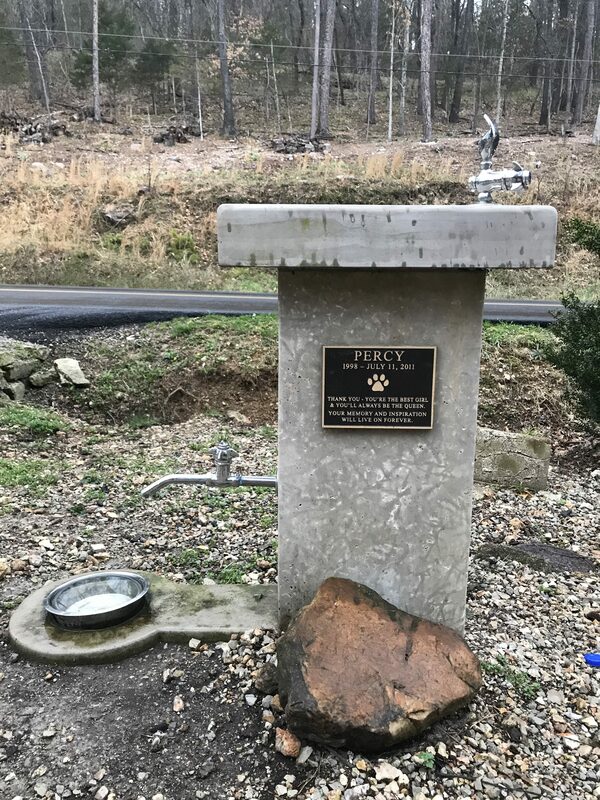 The trail is dog-friendly, complete with a water station at the start, and boasts one of the area’s most easily accessible waterfalls. An easy walk, the entire loop is only about 2 miles. It’s perfect for families with young kids, older adults and/or dogs. The trail is well-maintained and marked with metal placards describing a variety of species of plants and trees, and natural and man-made structures. For the trick to finding Tanyard Creek, click here. Located in the McIlroy Madison County Wildlife Management Area, 20 minutes from Eureka Springs, is a stunning overlook of the Kings River. An easy .5 mile hike down an old Jeep road will get you there. You will definitely want to keep a non-flexible leash on your pup for this one and hold the hands of young kids. The trail follows the bluff ridge, with plenty of drop-offs, and ends at the overlook on the edge of a tall cliff. There are NO barriers. If you are afraid of heights, this is not the view for you. I’ve only highlighted a few of the great places to explore in Northwest Arkansas this spring. If I’ve missed your favorite, leave a comment and let me know. Regardless of where you go or what you do, or what being “outdoorsy” means to you, I hope you’ll take some of these suggestions and create an adventure with your dog in the Natural State. I tried to find the dog park at the park in Springdale. I drove all around that big park and did not see anything looking like a dog park. Can you give me more directions on where it is? It’s the closest option for me. HI Kaitlin! Thanks for reading and following our adventures. If you take Don Tyson Pkwy east past the main park, ball fields, etc. you should come to the dog park. It is on the far east end of the park on the south side. Shout out to my friend and former geography teacher, from NWA Dog Blog, who gave me the cardinal directions to share with you instead of “left/right” and “down a ways.” Hope this helps! Hi Julie! Thanks for reading and thanks for asking! I called Rogers Parks and Rec department and they gave me an exact address. That would have been useful when I was trying to find the place myself. I don’t know why I didn’t think of doing that sooner. The park is located at the Pleasant Ridge Trailhead. The address is 1615 Pleasant Ridge Rd. I’ll update the post, too!